With 2018 coming to a close, bluegr Hotels & Resorts have taken a bow for their huge achievements. The luxury hotel group enabled guests to experience the most romantic and serene suites, explore the best of Greek culture and arts, and provide the perfect selection of Greek treats. Read on to discover these admirable 2018 highlights. Already the crème de la crème, Minos Palace is Crete’s gift that keeps on giving. This year, guests were guaranteed to find the most romantic and indulgent experience to date in the palace’s new waterfall suites. Earthy hues and wooden accents fill each space with a grounding ambience, so guests were able to completely relax and unwind. Louvred doors open to a private terrace, where everyone found their own freshwater pool complete with shimmering waterfall. The only difficulty they might have found was trying not to spend their whole holiday marvelling at the views of Mirabello Bay and the town of Agios Nikolaos. Those who were lucky enough to treat themselves to a trip to Crete in July have come back with gushing reviews of blueFest Crete. The three-day festival in Agios Nikolaos celebrated the best of Greek arts, theatre, music and cinema. Aside from soaking up beautiful sculptures, paintings, Greek bands and films, festival-goers at the first ever blueFest enjoyed DJ sets on the beach and a cocktail party against a backdrop of seaside-town views. Famous for its mouth-watering cuisine, Greece is the ultimate foodie destination. And in 2018, bluegr Hotels & Resorts made it possible for visitors to get the full spectrum of Greek specialities in Crete. 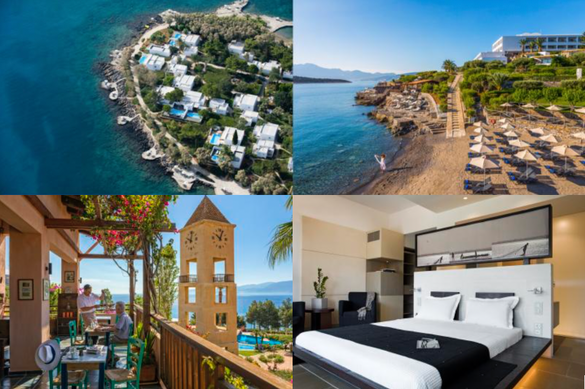 The luxurious 5* Minos Beach art hotel added two more irresistible venues to its four three restaurants. Guests flocked to La Cave de La Bouillabaisse on the shores of Mirabello Bay to experience one of hottest wine spots in town. For those who wanted an authentic Cretan experience, there was no better place than Adeste Kafenion, where they enjoyed raki and meze in a traditional local setting. For 2019, bluegr has some real treats in store! As a starter, more exciting room renovations are on the cards, as well as a new redesigned reception, lobby, main bar & restaurant in Minos Beach art hotel and a new all-day lounge in Minos Palace hotel & suites. After the success of 2018’s festival, blueFest Crete 2019 will be back with a juicy line up of bands, artists, cinema and theatre. If you are looking to experience luxury alongside first-class Greek culture, arts and gastronomy, bluegr Hotels & Resorts has all this and more. Plan your stay at bluegr.com. The bluegr Hotels & Resorts Company features the best hotels in Greece. Each property in the bluegr collection combines the three pillars of quality tourism: exceptional service, authentic experiences, and breath-taking locations. bluegr ensures holidays of leisure and wellness, business and pleasure, family fun and romance, and memorable experiences you will cherish for a lifetime.